One of my co-workers recently shared this recipe with me and because she is such a great cook I had to try it. This is a great summer salad and I hope you try it because you won't be disappointed!!! The recipe originates from Kraft Canada and the dressing is Kraft Raspberry Vinaigrette. I am not usually a big fan or prepared salad dressings but this one is an exception to the rule! The combination of flavours is perfect.... sweet pecans, salty feta, fresh watermelon, buttery lettuce, tangy onions all smothered in a light raspberry vinaigrette, need I say more?? There is nothing like biting into this crispy, crunchy green onion cakes. We first discovered these cakes at the Taste of Edmonton Food Festival. You can also buy them frozen from most Asian Markets but you just can't beat this homemade version. When ever we make these they get gobbled up!!! Serve them with hot chili sauce, soya sauce or sweet chili sauce. 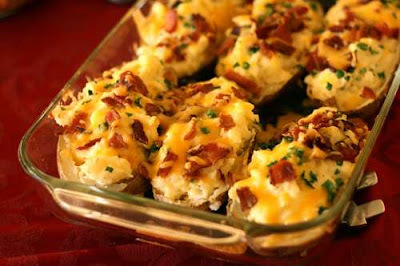 The secret ingredient in these stuffed baked potatoes is the dry ranch dressing. We make these potatoes quite often for family events. I make them the day before and keep them refrigerated. These potatoes freeze well . 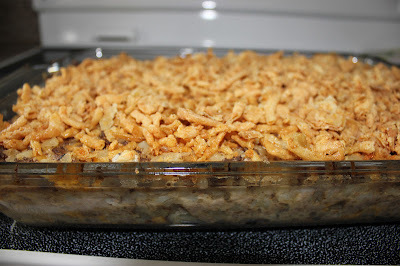 This casserole is one of our family favorites and very easy to make. When the our children moved away from home they would call for recipe and made it regularly. It makes a large quantity, so now I normally make in two separate casseroles and freeze one. This is a nice refreshing drink to have on a hot day. Easy to make and great to have on hand for a drink out on the deck. The alcohol keeps the liquid from freezing solid, so it has a slushy consistency. I make my slush in a 4 litre ice cream pail and it keeps well for up to 3 months. If you don't like gin just double up on the vodka. This is one of my families favourite sandwiches. Flavourful chicken topped with cucumbers, tomatoes, red onion, feta and tzatziki, then wrapped in a grilled pita, sooo good!!! Finding good Greek pita bread is sometimes a challenge. Greek pita does not have pockets and looks like semi-cooked pizza dough. It is light and soft and so good. I buy my pita from a chain restaurant called Opa. They sell their pita in bags of 8 or 16 in the restaurant. I have frozen and thawed it and it retains its freshness. I make my own Tzatziki but you can buy good quality store bought Tzatziki. This recipe was found on one of our favorite recipe sites http://www.recipegirl.com/. We are not fans of cake mixes but with the addition of a few added ingredients these cupcakes are absolutely amazing and we highly recommend. 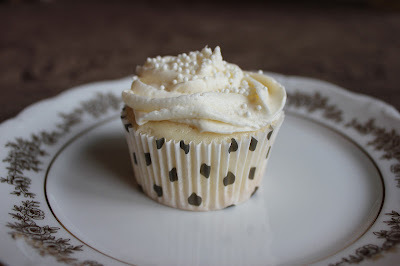 The butter cream icing is NOT a sweet icing but smooth and creamy. These skewers are great for a make ahead appetizer and are one of our favorite appetizers to serve when we are camping. The meat and marinading can be done ahead at home and then assembled and cooked while camping or when ready to serve at home.